Victoria, Feb. 2, 2016 – WWF-Canada applauds the agreement announced yesterday that will permanently protect 85 per cent of the Great Bear Rainforest from logging. 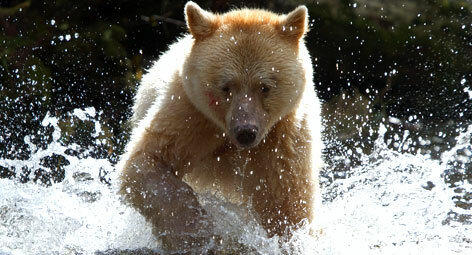 Twenty years in the making, the new protection plan shows that First Nations, government and industry can work together to plan the long-term security of people and species in the Great Bear Rainforest along British Columbia’s central coast. To build on this success, the next step is to ensure that marine management plans already underway in the Great Bear Sea continue to be implemented. B.C.’s Pacific Coast is healthy and productive, but faces growing pressure from increased human activity. 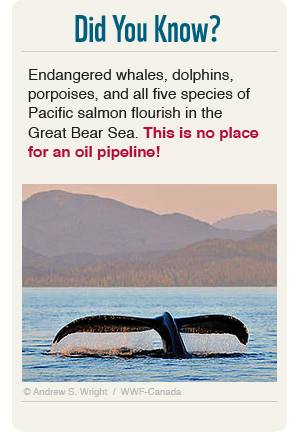 Better planning and marine protection is needed in the face of proposed oil and gas pipelines, increased shipping, growing port construction and other industrial activities. To ensure the marine environment is used sustainably, WWF is advocating for the implementation of the recently signed Marine Planning Partnership (MaPP), an important plan to which WWF contributed. The MaPP lays out how the region can manage growth while maintaining a healthy ocean ecosystem that benefits the area’s communities. In 1997, almost every valley of the Great Bear Rainforest was slated for clear cutting. After 10 years of negotiation, First Nations, forest companies, environmental organizations and governments created a world-leading model of ecosystem management for the region. In 2007, WWF celebrated this achievement with our prestigious Gift to the Earth award. Close to 10 years after the Gift of the Earth award and continued negotiations, the resulting deal will see 6.4 million hectares of forest — an area two times the size of Vancouver Island — fall under permanent protection. The remaining 15 per cent will be open to logging, but is subject to North American’s most stringent commercial standards. The Great Bear Sea is one of the richest cold-water seas in the world but it is virtually unprotected. It is home to an incredible diversity of seabirds, fish and whales. The rainforest plays an important role in providing food for this diverse ecosystem in the form of runoff of nutrients from the land that feed the marine environment. 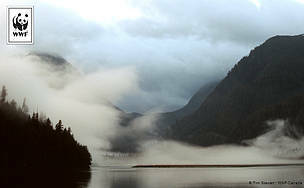 The ocean also provides many of the nutrients the Great Bear Rainforest needs to flourish. The regions’ many wild rivers form an indispensable link between land and sea. Wild salmon swim the rivers, returning to spawn and die, delivering nutrients to streams deep into the forest. Food from the sea is an integral part of many First Nations communities in the region. Kelp, herring roe, scallops, geoducks, oolichan, salmon, rockfish and halibut are among the wealth of traditional harvest here. To address increased pressures from development, First Nations and the provincial government signed the Marine Planning Partnership (MaPP) initiative on April 27, 2015 to establish a template for marine plans to protect more than 102,000 square kilometres on the B.C. coast. The MaPP plans recognize that the health of the marine environment is the foundation for healthy communities and economies. While a big step forward, there’s still more work to be done. Key federal departments with authority over marine sectors, including shipping and commercial fishing, fall outside of the MaPP plans. Following the November 2015 announcement of a tanker moratorium in the Great Bear Sea, it is now very important to push for a legislated ban on tanker traffic in the region to discourage oil and gas pipelines from being planned through this sensitive region. MaPP also offers the federal government a strong framework to help it reach its commitments to increase marine and coastal protection from 1.3 per cent to 10 per cent by 2020.